Fruits and veggies should appear as fresh as possible in your food photographs. But, you can run into some problems when styling and shooting produce images. Fortunately, there are some helpful solutions available that can help you deal with persnickety produce in your photo shoots. When produce is growing out in a field or garden, the water evaporating from the plants is replaced by the water sucked in by the roots. When the produce is picked, that cycle breaks and the produce soon starts the wilting process. At that point, the clock starts ticking on the freshness factor. Time can take its toll quickly, particularly with very thin or very delicate produce, like leafy greens. On the fruit side of things, cut fruits can dry out quicker than you’d think. Melons and citrus fruits can look a bit sickly after just a little time under the lights, and cut apples can discolor quickly. Hardier types of produce, such as cabbages, are much easier to shoot. These veggies have thick, waxy leaves and take a long time to wilt. The following figure shows fresh, leafy produce that actually looks fresh in the photo. Swiss chard is a sturdy vegetable that, if refrigerated, will keep nicely for a couple of days until you need it for a shoot. 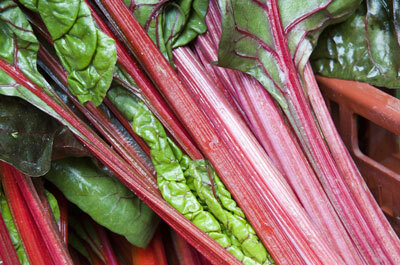 Fresh Swiss chard ready for action in a food photo. Say you have an important shoot coming up on Monday. On Sunday morning, you visit your local farmers’ market to pick out the freshest produce, perhaps some accent herbs and greens to complement the subject you’re preparing to photograph. You stick the greens in your refrigerator to wait for your shoot the next afternoon. At the shoot, you work under continuous light for an hour or so and suddenly you notice that you’re working with a bunch of less-than-perky greens. As you can see in the following figure, limp, wilting produce is fairly noticeable in photos. 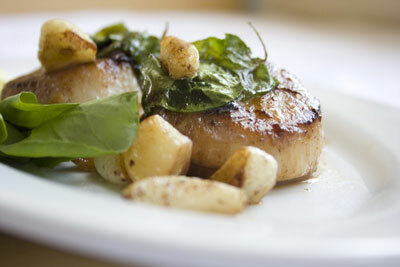 Wilting accents can ruin a food shoot. To solve the problem of produce wilting, be sure to refrigerate delicate produce until ready for use, and use the produce for photos within five or six hours of purchase. Work quickly when shooting with delicate produce, and if possible, limit its time under the lights. If you’re using continuous lights for the shoot, turn them off when you’re not shooting. Veggies aren’t the only foods that wilt. Fruits can also take a great toll under the lights. Cut apricots can shrivel; watermelon can get mushy; bananas, well, bananas just start looking a little like mud. As a food photographer, you need to be aware of a few simple tips and techniques to combat the wilting problem. As it is, even very fresh items get a little droopy under continuous lighting, or any type of warm conditions, so using the absolute freshest ingredients possible and handling them well is the best way to work with produce. After shooting under the lights, your produce may end up looking lackluster. Of course, the first order of business is getting the freshest possible produce. Purchase fruits and veggies the day of the shoot if you’re able to. Doing so really makes a difference in your photos, particularly with leafy vegetables. Buy your produce at a farmers’ market or an upscale market. 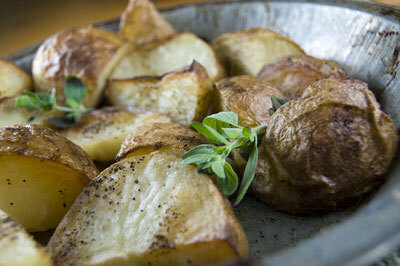 Keep a fresh cut: Sitting next to other vegetables, cut tomato wedges can look tired rather quickly. Keeping a fresh cut — meaning you may have to cut fruits and veggies more than once — on your produce provides a fresh surface so it looks its best. Undercook veggies: For cooked vegetables, undercook by several minutes. After you remove the veggies from the heat and drain them, blanch them with cold water to really make the color pop. Overcooked veggies often look limp and somewhat off-color in images. Keep it chilly: Freshly wash and chill your raw fruits and vegetables in the refrigerator. Keep any excess in the refrigerator so you can bring out fresh chilled fruits and veggies when your initial batch is fading. Always have extras available to swap in as necessary. Manage the moisture: Rinse your raw fruits and vegetables with water to help renew the moisture content. If you need only the illusion of moisture, use glycerin and water spray. Water droplets give the aura of just-picked goodness in your images. 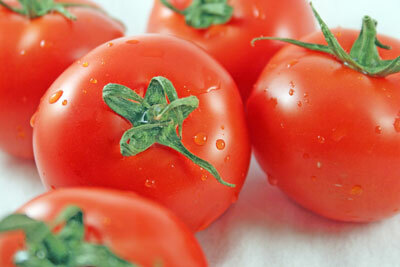 Water droplets on tomatoes help make them look fresh. Spritz some lemon juice: Cut apples, some pears, and even bananas can discolor rather rapidly, which isn’t a good look during a shoot. Mix equal parts lemon juice and water in a squirt bottle. As soon as you slice your fruits, give them a good spritz to help keep them looking fresh. Take an icy plunge: Peels, such as carrot curls or celery, can be immersed in ice water to make the thin-cut veggies appear super fresh.